International arms sales represent an enduring and prominent feature of American foreign policy. The United States sells or licenses the sale of weapons to other governments to advance its foreign policy, security, and economic interests. But when US-made or sold weapons fall into the wrong hands or become associated with corruption, human rights abuses, violations of the laws of war, and human suffering, the United States may be exposed to legal, moral, reputational, and strategic risks. 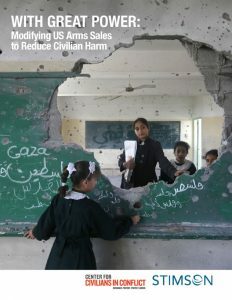 This report assesses existing controls and identifies ways to modify the US arms sales process to reduce civilian harm associated with US-sold weapons, while preserving the intended policy benefits of international arms sales.